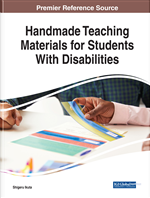 This chapter is designed to inform and educate 6th- through 12th-grade teachers on how to provide math activities for students with an identified learning disability as defined by the Individuals with Disabilities Education Act. The chapter provides an introduction to the topic, background information on teaching math at the secondary level, research-based instructional strategies that can be used for teaching math to students with identified special needs, and specific manipulatives that can be created and utilized to teach the Common Core State Standards in Mathematics to this population. Additional resources and readings are included as well. When teaching math to middle and high school students with special needs, teachers must remember that these students, like any others, go through three phases of math comprehension: concrete, semi-concrete (or representational), and abstract, or CRA. For example, if a student wanted to find the answer for the problem 4 + 5 = 9, the three math phases could be illustrated as shown in Figure 1. Unfortunately, some students may remain in a particular phase and not reach the highest level. These phases are discussed in more detail below. The first phase, concrete, involves learning the concepts through hands-on materials, or manipulatives. Manipulatives, according to Spear-Swerling (2006), are “concrete objects that are commonly used in teaching mathematics” (para. 1). Examples include but are not limited to attribute blocks, plastic counting cubes, base-10 blocks, fraction pieces, and algebra tiles (Spear-Swerling, 2006). For example, students are taught in early elementary grades to count by moving objects like round plastic counters or navy beans from the left to the right; in middle or high school, students learn to add integers by using algebra tiles. When using these manipulatives, a student can place them in his or her hands and physically move them around. These activities not only assist the student in understanding the concept being taught but also provide another mode of learning. Examples of specific manipulatives are discussed in much more detail later in this chapter. It should be noted, however, that simply using manipulatives will not guarantee that the math concept being taught will be learned by the student. Teachers should be cognizant of the student’s developmental level and the appropriateness of the manipulative to the concept taught when deciding on which should be used. Teachers should also have a variety of manipulatives to demonstrate the same concept (e.g., using colored counters—red for negative and green for positive; using a pan balance, which is a measuring balance onto which the student places and removes cubes to learn how to solve an algebraic equation), as well as provide a verbal explanation. Both modes of communication will assist the student in learning the concept and transitioning from the concrete to the semi-concrete, or representational, stage.